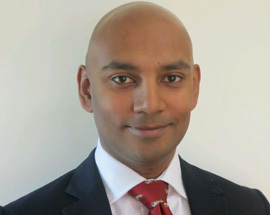 Mr Malin Wijeratna is a Consultant Orthopaedic Surgeon with a special interest in shoulder and elbow surgery. He qualified in 2002 from Guys, Kings and St Thomas’ Medical School in London. His postgraduate orthopaedic training was in the East of England Deanery in Cambridge and East Anglia, followed by two fellowships in shoulder and elbow surgery in Melbourne, Australia. His specialist interests are in shoulder and elbow arthroscopy and joint replacement. Mr Malin Wijeratna has been working as a NHS and private Consultant Orthopaedic Surgeon in Nottingham since 2015. He performs over 300 surgical procedures a year, but understands that there are many non-surgical causes of shoulder and elbow pain which require accurate diagnosis and appropriate management. Mr Malin Wijeratna performs steriod injections, hyaluronic acid injections, surgery for impingement, stiffness, instability and arthritis. He will work closely with your physiotherapist to ensure optimal outcomes. Mr Malin Wijeratna is widely published in the orthopaedic peer reviewed literature and has delivered many national and international presentations. He has been awarded prizes by the British Elbow and Shoulder Society for his research work. Mr Malin Wijeratna has always had an interest in teaching. He has arranged live surgery courses for experienced shoulder surgeons. He has been faculty for the Cambridge FRCS course and ORUK FRCS course teaching senior Orthopaedic trainees. He is the Orthopaedic Education Lead for Nottingham University Medical School. He regularly gives presentations to General Practitioners about shoulder and elbow problems in Primary Care. He is keen to share information about the latest advances in shoulder and elbow surgery. Mr Malin Wijeratna takes patient safety very seriously and is the Clinical Governance Lead for the elective orthopaedic department at Nottingham University Hospitals NHS Trust. Arthroscopic shoulder surgery, shoulder trauma, shoulder instability, biceps pain, shoulder arthritis, frozen shoulder, elbow stiffness, tennis elbow and sports injuries, shoulder replacement surgery, acromio-clavicular joint pain.